ATLANTA (April 13, 2016) – Georgia Aquarium is celebrating National Volunteer Appreciation Week for more than 1,100 volunteers and interns. Since opening in 2005, Georgia Aquarium volunteers have spent more than 1.6 million hours to help keep the Aquarium running smoothly. So far for 2016, over 41,000 hours have already been volunteered. 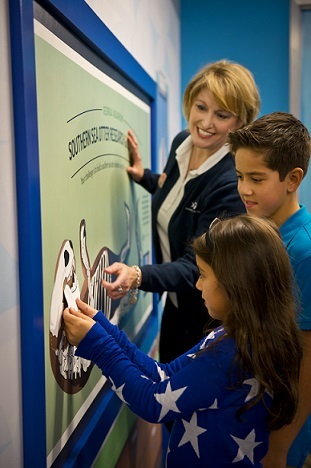 Volunteers are utilized in welcoming guests and assisting them with directions and general information, as well as engaging guests of all ages about aquatic life in the multiple galleries in the Aquarium. There are volunteer opportunities available in more than 20 different departments at Georgia Aquarium, including behind the scenes, assisting in repairs, water quality tests, animal care, and diving and cleaning exhibits from the inside. Georgia Aquarium volunteers have the unique experience to help entertain and educate millions of guests each year. Volunteers interested in diving or helping behind the scenes must complete 50 volunteer hours in the public areas and may be asked to complete additional training. Each year, the Volunteer Programs Department chooses a theme and decorates the office in honor of volunteers and interns for National Volunteer Appreciation Week. This year, the theme is “Volunteers are stars at Georgia Aquarium.” To show appreciation, volunteers are encouraged to come by the office for snacks, drinks, artwork and more. For more information on volunteering and how to get involved, please visit www.georgiaaquarium.org/volunteer.